Yesterday, I went for a comfortable and casual look to stroll the streets of NYC. I added my pearl stack and pointy flats to give a feminine finished touch. Hope you all are having a wonderful week, happy Thursday! This is such a great casual outift- love, love, love! Such a simple outfit, but it’s one of my favs! Relaxed AND pretty! I add pearls too when I want to update a simple t-shirt and jeans look, or I add scarves. Very cute! I love that even though you are just having a casual day you still wear pearls and pull it off so well! Love this simple summer look! Have fun in NYC! Beautiful simple look! Love the pearls! You look gorgeous! Love this casual look! You still always manage to add that extra oomph though! Comfy, casual but still very stylish. You look great! Hope you’re having fun in NYC! 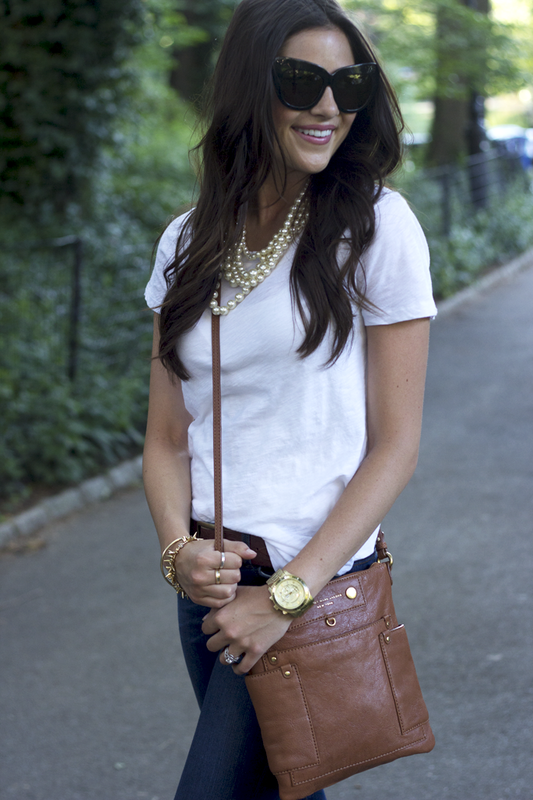 love the simplicity here – especially the pearls and gold jewelry to accent a classic outfit! i love this outfit – this is how audrey hepburn would dress if she were around today! :) you look so chic! Wow, this outfit is perfect!! I can never seem to pull off looks like this…I just look boring…so annoying! Casual but chic too!! Love! Love the new bag! Comfy is the way to go for NYC, put definitely polished with the pearls and pointed flats…super cute! AH i love this! so chic and classic!!! so casual & yet still so chic – you pull it off well!! you are gorgeous and i love the sunglasses! Love this outfit. Very simple but also very nice. love jeans and a white tee – definitely my favorite!! love your pearls! i always feel kind of silly wearing them, but seeing them stacked like this makes it look so cute! I love the simplicity of this look, you look amazing! And your necklace is simply gorgeous! Cute casual look. I am heading to NY in the fall, can’t wait. Hope you have a wonderful time! I really like the simple chic vibe to this outfit! 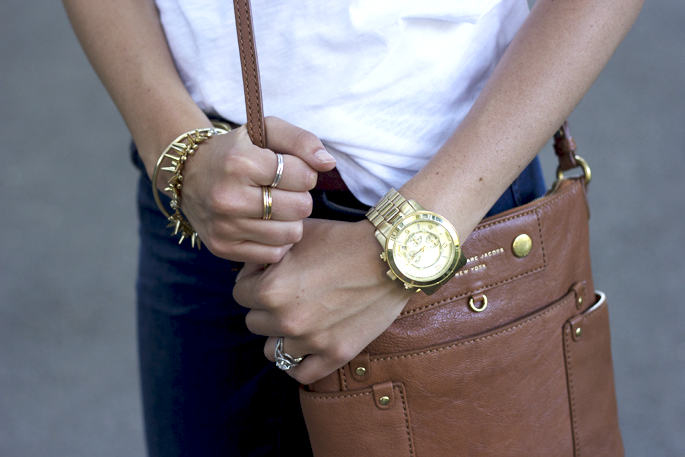 The neutral colors in your accessories look great with the classic jeans and t! simple is seriously the best sometimes! love this look and the bag is so cute. I miss NYC! Love this causal look, simple and still chic! I love NYC and this look! The perfect outfit for the most perfect place! I hope you are having a wonderful trip! This look is perfect! You look great for NYC, hope you’re having a blast! This makes me want to plan a trip back to NYC asap! Your oufit is perfect! Laid back but still stylish. such a pretty and casual look! love it! This look is perfect for NYC! You have amazing style, love how you put outfits together! It’s amazing how you can make jeans and a t-shirt look so stylish! This is proof that accessories (and a beautiful lady) make the outfit!! loving the bag and the shoes are adorable! Just came across your blog today and I am sure you hear this all the time but you have great style. I love style that seems simple and effortless. That’s such a simple but yet great! Perfect! Beautiful look! Love the pearls added! a white tee and skinnies are always simple, classic and so so chic! So jealous right now! Ive always wanted to go for a run through central park. And I dream on getting on Kelly Ripas show!! Great post. Love the marc by marc jacobs cross body bag! So simple outfit, but georgeous!!! I love how your necklace elevates the whole outfit. Perfect. This look is so simple yet so chic! I love the bag. I have always wanted to visit Central Park! Maybe one of these days….. I have the same necklace and could honestly wear it every day! Such a great staple, especially living in the South! this look is so me, love love love! Absolutely fantastic outfit for NYC! Love this look! I have the necklace and similar items to recreate! Thank you! Hello Rachel, I discovered your blog a few days ago, I like your style very much. I am from Spain, where do you live in the US? How old are you? Great outfit, you look georgeous! Such a simple outfit but you still manage to look chic! perfect outfit for the city!! love the bag! This is such the perfect look for walking around, sightseeing. Jeans & and white tee are so classic and comfortable. Paired with the adorable flats and pearl necklace, perfect! I love how you make jeans and a t-shirt look so chic! So casual and yet, so elegant and chic! You are the epitome of classiness. I love it!